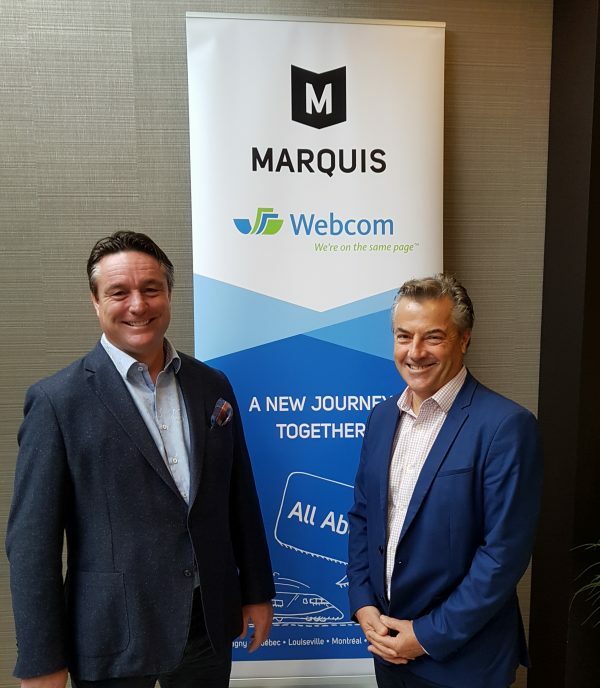 Marquis Book Printing President and CEO Serge Loubier (left) stands with Webcom President and CEO Mike Collinge. Marquis Book Printing, headquartered in Montmagny, Quebec, acquired Toronto-based Webcom Inc., creating a combined enterprise with more than (C)$100 million in sales and an annual production capacity of approximately 132 million books produced within three printing plants that comprise 420,000 sq. ft of total manufacturing space. Annual sales of the newly combined organization catapults it past fellow Canadian book manufacturers Friesens and Transcontinental, effectively making Marquis the largest book manufacturer in Canada. He also reiterated to Printing Impressions in a followup conversation that the transaction combines two strong industry players. "We brought together two well-placed, well-developed companies. It's far from a tuck-in deal," Loubier stressed. "We want to be a world-class provider to meet the needs of global publishers." With nearly 3,000 clients, Marquis also does work for several top-tier North American and European book publishers, including Oxford, T&F, McGraw-Hill and Hachette, among others. The combined strengths of Marquis and Webcom will help these North American and European book publishers navigate changing supply chain dynamics with print-on-demand printing, automatic stock replenishment and complete “life of title” management solutions. As a result of the acquisition, Marquis Book Printing's head count will grow from 400 to 600 employees. The two companies also complement each other's respective customer bases well and create a combination of latest-generation production inkjet presses for short-run book printing. Founded in 1977, Webcom has 3.2 billion pages of annual manufacturing capacity within its 170,000-sq.-ft. Toronto facility. Its output capabilities include high-speed HP T300 and HP T360 inkjet web presses, two heatset web offset presses, a coldset web offset press, an HP Indigo 10000 digital press and a six-color sheetfed offset press. In March, Webcom acquired York Bookbinders, a 34-year-old business specializing in hardcover/casebound book bindery services, which added 7.5 million hardcover books per year to its manufacturing capacity. York will move into Webcom's facility by the end of the year. The Webcom acquisition follows the partnership agreement Marquis announced in June with EPAC, which involved a $9 million investment to install three high-speed inkjet production lines at its Montmagny plant. According to Loubier, the lines include Fuji inkjet web presses and Hunkeler and Muller Martini assembly and perfect binding lines. Plans are for a total of six such inkjet lines, he said. As a result, Marquis is taking three toner-based digital web presses and a web offset press out of commission. The EPAC solution manages equipment from different manufacturers in a single, integrated and automated workflow. All of the new inkjet equipment at Marquis is interconnected using an automated production flow developed by EPAC, called PACEX. A machine interface enables direct communication with the equipment without human intervention and also cuts down on paper usage. With Marquis having exclusivity with EPAC for Canada, the EPAC supply chain also provides Marquis clients access to the entire EPAC network, which includes production facilities in Asia, the U.S., Europe and Latin America. Established in 1937, Marquis serves content owners in the publishing and communications industry in Canada, the U.S. and Europe out of a 250,000-sq-ft. manufacturing plant in Montmagny and a second operation is Louiseville, Quebec. It operates six Timsons web offset book presses, and recently acquired a Timsons ZMR press from the former Edwards Brothers Malloy operations, noted Loubier. Sheetfed offset capacity at Marquis includes 10- and 8-color, 40˝ Heidelbergs and a six-color, 29˝ Heidelberg press. Marquis Book Printing offers one-stop shopping for file management, graphic design and traditional printing, primarily in the book sector. Marquis also deploys multi-platform digital content through its Marquis Interscript division, as well as in the printing of yearbooks and agendas through Marquis Le Laurentien.